This self-sown Lazy Housewife Bean plant, pretty much looked after itself over summer. It grew 230gms of dried beans (minus all the ones I ate fresh off the plant). If only all my plants performed so well. 230 grams of beans from only one plant! At the end of summer it’s now time to pull this worker out. Thankyou bean plant. All the pods on the plant before I harvested them. One last tomato sandwich, at least using our home grown tomatoes. Our Christmas tradition continues with the annual dressing of the Kambah Village sheep. So all that remains is to wish you all Season’s Greetings and here’s to 2019! Just a quick photo today of some of our garden peas. I am shelling them, just before putting them in boiling water for one minute to ‘blanch’. After blanching I will store them in our freezer to eat another day. Soil – grow your own! I missed the United Nations World Soil Day, 5 December, this year, but by way of compensation I have found this post on making compost from earlier in the year, which never made it beyond draft stage. Don’t worry about the references to Autumn, compost making is a year round activity. Enjoy! “As autumn moves along we are clearing out the last of the summer veg and rejuvenating our soil before we plant new crops for winter. This means digging in some of the lovely compost we’ve been ‘growing’ over the last few months. OK, so we’ve just added the material to the bins and the worms, slaters, and other microorganisms are doing the hard yards at breaking the stuff down. The tomatoes have been cleared out and compost and dolomite lime added ready for new plants. If you have space for a compost bin then setting one up is a no-brainer. It is an excellent way to reduce some of the costs involved with renewing your soil to ensure your plants get plenty of nutrients. The golden ratio when it comes to making compost is 1 part of green waste to 3 parts of brown waste. In laymans’s terms the ‘green’ can include household veggie scraps (no meat), or green garden waste such as prunings or fresh grass clippings, tea leaves and coffee grounds. Coffee grounds are an excellent source of nitrogen and they are not acidic after they have been brewed. While some tea bags are compostable many tea bags are now wholly or partly plastic, and you don’t want to include any of these in your compost. The ‘brown’ could include dry leaves, shredded or torn newspaper, shredded office paper, or used bedding from the chook pen. Our compost has a bit of all these. A barrow load of goodness from our compost bins, which you can see in the background. One of these bins is dedicated to the super-slow breaking down of leaves into leaf mould, the others are for compost in different stages of decomposition. find another source of green waste to add to your bin by collecting coffee grounds from a cafe or even leaving a small bin to collect compostable waste from where you work. Having set up the bin you also need to feed and mix it up or ‘turn’ it regularly. Let’s face it the worms aren’t going to hang around if you don’t give them some new food every so often. Turning your compost bin allows the air to get into it, to ensures faster decomposition. It also reduces the risk of creating ugly smells. 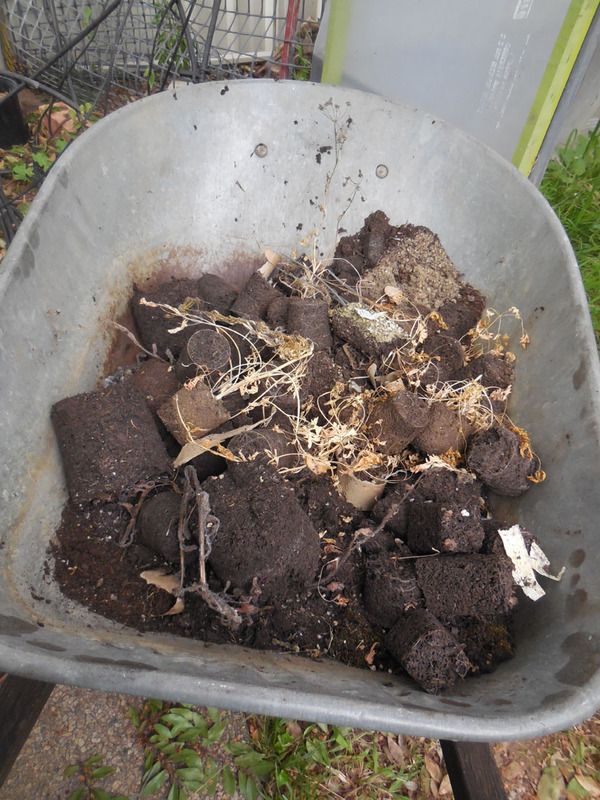 If you have a compost bin it is just about impossible to turn the contents with a garden fork. If you have a heap or compartment system then a garden fork is fine. The best device I’ve found to ‘turn’ my compost is this strange piece of metal with a ‘screw’ on one end. By turning this tool into the compost you can easily mix the bin’s contents. To avoid giving yourself a hernia I suggest you make some shallow digs into the upper 15 cms before you drill further down. It’s really not too difficult. Getting ready to turn the compost. If you are checking the compost every week (you should be adding stuff to it regularly), then you should be able to head off potentially unpleasant compost situations. If your heap does go wet and nasty make sure you add lots of dry ‘brown’ material and mix it through thoroughly. 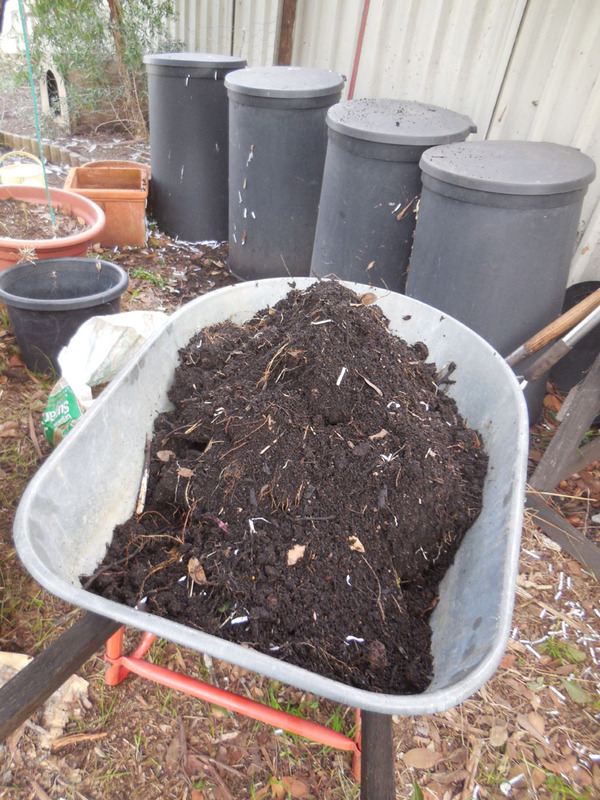 Keep a close eye on it until the compost is evenly damp, rather than a foetid mess. Before I forget, you can also re-cycle your spent potting mix through your system. The potting mix will get nutrients as your heap decomposes and the potting mix will add some structure to what’s in the bin. Re-use and re-cycle also applies to old potting mix! So happy belated world soil day! This year my corn planting got off to a very rocky start. Out of habit, and no really good reason, I have always started my corn off in toilet roll tubes and then planted them in the garden when they got to a good size. I tried it this year with two (new to me) varieties, Painted Mountain and Ontos Oval, a popping corn. It was pretty much a complete failure with only 4 of 24 seeds germinating. It didn’t take long to work out that the potting mix was to blame. What has always been a good quality brand appears to have changed it’s mix, or maybe quality control wasn’t working because what we got was completely impervious to wetting. I even resorted to pulling the seed back out and potting in a different mix. I got another 3 seedlings up but I have written the rest off. That left me doing what I should have done originally, direct seeding into the garden beds. 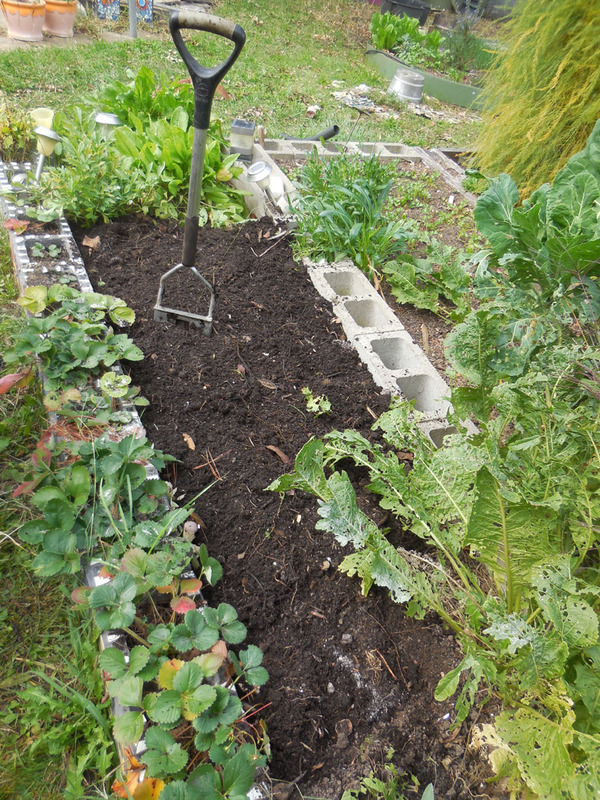 I am having a play with planting one batch of Painted Mountain corn into the bed that had my broadbeans in it. Given that last year’s re-grown broadbeans gave us the most pods this year, I have cut the recent crop down to ground level and planted the corn between them in the hope that the broadbean roots will continue to fix nitrogen into the bed. The beans are already re-shooting. Broad beans re-shooting with one of the few Painted Mountain corn seeds that germinated first time around. Both types of the direct seeded corn are sprouting now, along with their ‘sister’ beans, this year it’s Lazy Housewife beans. Lazy Housewife beans and the Painted Mountain corn sprouting. The third ‘sister’ I have only planted in one bed. Rather than the traditional pumpkin I have planted Purple Sweet Potato. These are purchased plants, as we were totally unsuccessful at striking cuttings from a tuber as we had planned. Sweet Potato plants with the corn sprouting alongside. I hope that the sweet potato will grow as well as the crop I saw at the open garden I visited a while back. Enjoying breakfast outside is one of the pleasures of the spring weather. Today I could hear the sounds of baby birds begging for food. Magpie chicks out the front and a Pied Currawong in the back garden. The bird in the back garden is a special case. The little Pied Currawong was blown out of it’s nest during violent wind storms about 10 days ago. We consulted our local vet practice who advised that if the parents were still looking after the baby we should focus our involvement on keeping the chick safe from ground predators. We took their advice and have had some interesting times since. Our first decision was to try and keep the chick in one of the outside chicken runs. This way the parents could easily feed the baby but the fences would provide some safety from the local cats, dogs and foxes. The chick had other ideas. This little bird has hopped around and over the fences we hoped might keep it in the safer parts of the garden. It was more difficult to decide how to handle overnight management of the chick. The first night we couldn’t find the chick and despaired to find it again. Yet the next morning there it was several metres up a tree! Unfortunately it didn’t take long for the little bird to be hopping down from it’s safe perch. Since that first night we have opted to put the chick in one of our pet carrying boxes each night. The box stays outside where the adults can see the chick and I get to get up at day break to let the chick out. It’s a good thing we did this, as a few days ago I walked down to let the chick out and found a cat’s collar and bell on the path only a few metres away from the cage. A couple of times a day we pick the chick up off the ground because we are worried that it could also be attacked by our chickens (sometimes chickens act in unpleasant ways). I have learned the hard way to give the chick a sturdy stick to hang onto, so I avoid painful puncture wounds. I also want to avoid handling the chick as much as possible. We don’t expect the chick will be around for much longer as every day it’s wings carry it a bit further into the trees. It still remains fully dependent on the parents for food and looks like that will be the situation for some time to come. In the interim we enjoy our small visitor while the parents remind us that we are tolerated as helpers, but that’s all. I see it’s been a while since I last posted which is mainly due to us being away again. Sadly while we were away our oldest chicken Artemesia (AKA Arte), left us for the great chook perch in the sky. The ever reliable broad beans have gone from small plants to barely constrained in 6 weeks, as you can see from the photos. The other half of the team has been experimenting with kang kong/water spinach. We got a bunch from the markets and stuck a few stems in a bottle of water. Just over one week later it has roots galore! We will be planting it out very soon. Although it is a tropical plant our summer’s in Canberra are hot enough for us to get a useable crop in one season. These will be a great addition to our stir fries. That’s about the only way to describe the smell in my car this morning as I drove home from the nursery with bags of compost cow manure and potting mix. Luckily I was able to temper the odours a bit by stopping at the local coffee shop to pick up a large bucket of coffee grounds. I even had time for a cup of hot chocolate and a quick sketch. The coffee grounds will be used as a barrier to dissuade the local snails and slugs from completely destroying the lettuce and kale seedlings. Much more pleasant was the glorious scent of the broad bean flowers, next to where the lettuce were planted out. And yes I even managed to plant out all the new seedlings and pot up my new Bay tree. Must be the scent of spring!